Niche: Helping people overcome crippling emotional blockages through healing and coaching. 1. Where Alex was before joining Consulting Accelerator. 2. How Alex got clarity and confidence with her niche. 3. Who Alex helps and the problems they experience. 4. The strategy Alex found in a personal transformation niche to land clients organically. 5. How Alex conducts her strategy sessions. 6. How Alex packages and prices her offer to his clients. 7. Alex’s vision for herself and business in the next 5 years. 8. The most transformative part of the program for Alex. Feel the fear and do it anyways. Just keep pushing and do the work! Nick Hauser:	Hey everyone, Nick Hauser here, and in today's interview, we'll be speaking with Alex Kemp, who was a member of our consulting accelerator program. 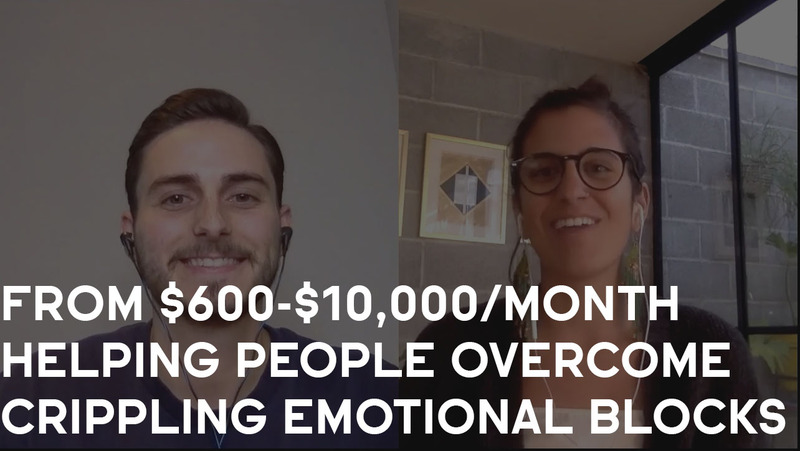 She joined about three months ago, and she's taken her business, actually, from making $600 a month, all the way to making $10,000 per month, right now. And, I wanna make sure I get this right. Alex helps people overcome crippling emotional blockages through healing and coaching. So, a really interesting one. It's nice to see somebody who has more of a emotional transformation, personal transformation, kind of niche and stuff. So, yeah, I'm excited to jump in here and hear your story. How are you doing today? Alex Kemp:	I'm great. So, good. I'm so excited to be here and to talk about this. Nick Hauser:	Awesome. Alex Kemp:	Dive in. Nick Hauser:	So, let's just start out. Three months ago, 90 days ago, before you joined the program, what was going on? Alex Kemp:	Oh man. I was just really searching for direction. I started back in April trying to launch my coaching business, and I had no understanding of the business side of coaching, and I was just copying what everyone else was doing. I was also dealing with a lot of money blockages, so I didn't think I could charge that much for my coaching. Yeah. Like I said, I was making $600 a month, and then I found Sam's program. I always say that he targeted me perfectly on Facebook ads, 'cause I watched the webinar, and I was like, "Yeah, I'm doing it. This is exactly what I was looking for." Invested money I didn't have, and now I'm here. Nick Hauser:	And, before you joined, when you were making $600 a month, were you doing the same type of things or, how did that look? Alex Kemp:	Yeah, I was. Yeah I was. I was doing the same thing, but I was also just not as confident. I was struggling with a lot of the mindset stuff in my own life, because I was really putting myself out there for the first time ever. So, it was something I was doing. I'd been doing this for free for a long time, so I just started charging. And then, I also was a generalist. So, I wasn't very specific. Nick Hauser:	Got it. So, you joined the program and then what happened next? Alex Kemp:	And then, yeah, oh my gosh, it's crazy. It just took me on a journey of really pushing past my blockages, and being in the world of coaching, I know how important that is, and so it really gave me the group on Facebook, gave me a lot of accountability and having that support system. And then, I was like, "Okay, I'm just going to get really clear." And, what helped me the most is hearing that everybody has doubts, because that was probably my biggest blockage in the past, and it's still something that comes up for me. But, because I know that that's normal, I can not listen and keep pushing. So, it just gave me all these tools to just keep pushing, keep pushing, keep pushing, keep pushing, and now I feel like I'm in a groove with it. Things that were really hard for me in the beginning are now way effortless and natural. And so, it really helped me get into this ... It transformed my life in every way, I would say. From going from being broke to now being able to travel and do what I love while I travel, and afford it, and also really work to continue to evolve myself through this journey. Nick Hauser:	Yeah. Awesome. And so, you mentioned too, when you get it started ... So, in week one, obviously we know, but we narrow down on helping people pick their niche and the group of people they really wanna work with. Sometimes people have a difficulty choosing for that and everything, so how did you work through that, and what did that process look like step by step? Alex Kemp:	That's such a good question. I rewrote my message so many times. And, I just worked on it, worked on it, worked on it, until I found something that was resonate with me. And what I did was, I went back and I talked to past, or I looked at the past clients I worked with, and was like, "What was the most exciting for me. What am I the best at?" And, so, I wrote out a bunch of different ones. At first, it was helping people with insecurities, and I was like, "No, that's not quite right." So I just kept twitching, twitching, twitching, and then, honestly, even the one I have now, it works, and people respond to it really well. But, I still doubt it. So, that's the funny thing, and I think that's the part where I talk about just pushing through and just being like, "I wanna stick with this, and I'm gonna keep going." And, I've done all my 30 strategies sessions and everyone has responded really well to the message. So, I'm like, "There's something good there." But, really testing it with the market, and moving beyond my doubt. Yeah. That's a big one. Nick Hauser:	How important was it for you to, actually, get the confirmation, and then the confidence to move forward with all of this? Actually, going and speaking to real people versus just doing only researching yourself, or thinking in your own head? How important was that for you? Alex Kemp:	That was everything, everything. Yeah. It's true [inaudible 00:05:05] know when I started putting it out there and getting the feedback. I was like, "Okay, well, I got something going here," and then, just kept evolving and evolving. And, I also, in the beginning, I was twitching it a little bit based off of the conversations that I was having. And then, I was like, "No, I need to stick with it." But then, through those first, maybe, five calls I came up with this one, and then I stuck with that for the next ones. Nick Hauser:	Okay. So, you talked to the people, you gained the confidence, and then ... So, now I mentioned in the beginning too, but let's hear from you as well, who do you help, what is the person, what are they going through, and what do you really help them achieve? Alex Kemp:	So, I help people who are feeling stuck by some sort of emotional blockage, and this can show up in so many different ways. But, it's all the same work. So, some of my clients are healing from an abortion that they had in the past, or some people are feeling stuck in a relationship with their partner, and want to find themselves and feel whole on their own. It's all this stuff that has to do with feeling this sense of being stuck, and so what they achieve is freedom from that, and then the reason it's not just healing working it's coaching, is because once your not putting all of your energy in trying to figure this thing out, 'cause usually we unblock honestly in the first or second session. And so, it's like once we unblock that, it's like now they have all this energy, and they're like, "Where do I put it?" So, then it's about giving them direction afterwards, and helping them level up in their life, and in other ways as well. Nick Hauser:	Okay. So, that makes sense for emotional blockage. How, I guess, how do, like when somebody comes in and starts working with you, is there a specific group of people who, or a specific kind of emotional blockage that most of your clients, typically, have? Alex Kemp:	The words that I hear them saying the most is, "I feel stuck. I just don't know where to go from here." And, I'm trying to think if there is a common ground. I mean, yeah, they're all really different, honestly. But, they all have to do with emotional blockages, and so that's where I found ... I feel that one of my strengths is that I can work and meet so many people where they're at. I like that because it keeps my work interesting too, but it still is [inaudible 00:07:44]. Nick Hauser:	Got it. And, okay, so then you gain the confidence, you talk to the market, you iterated and improved your messaging, and so, once your content with that and ready to move forward, what did you do next to go to start finding and reaching out to potential clients, and then ultimately landing them? Alex Kemp:	[inaudible 00:08:09] really done. I haven't even touched Facebook ads yet. I've just been still gaining the confidence but that's my next step. And, what I have noticed is it is a little bit harder to do direct outreach for emotional stuff, but it's also really cool, because you're prying things out of them, and that' always been something that people have told me I'm good at. I've had this weird thing where people just drop their deepest, darkest secrets to me throughout my life. And so, doing this through direct outreach has just been like another way to facilitate that. Nick Hauser:	And, since you mentioned you help a large range of people, and such, and some things about Direct Outreach there, for an emotional, personal transformation like this, how did you identify the kind of person you wanted to reach out to with direct outreach, and then how did you communicate to them? You know? Alex Kemp:	Yeah. So, that was really hard for me, was trying to find people to reach out to. So, I just ... Because I have a Instagram follower app that gets new followers who are interested in things that I'm posting about. I would just message those people. But, the highest rate of people who are actually my clients are one, referrals, and two, through my posts. So, I post a lot of things, and I write a lot of things, and then it will hit home with someone or something, and then they'll reach out to me and be like, "Hey, I've been seeing what you're doing, and I wanna know more. I'm going through this right now, and I was wondering if you could help." So, it's kind of like people are reaching out at this point of desperation, and then a couple other ... I've also looked on hashtags with depression, or anxiety, or mental health awareness and things. So, just going through all the crevices, honestly, of anything that has to do with that, sort of, emotional block. Nick Hauser:	And, when you mention posts, do you mean on Instagram? Alex Kemp:	And Facebook, yeah. The two. Nick Hauser:	Got it. Have you found, for you, any one to be more powerful, or more of those people reaching out to you, actually? Alex Kemp:	Yeah, definitely. Instagram for me, because for the past four years or so, I've been posting and I've been sharing my journey very openly and vulnerably. So, I feel like I've gained a trust with the followers that I've had. So, now that I'm coaching ... A lot of my clients are actually people I know, and that's been amazing. People I would never have expected to be my clients, or to pay the money to be my clients, are my clients. So, I think that's another thing that I would encourage people to do is to reach out to people you know, because they might need it to. And, if you're really trying to offer value to them and you're really trying to be of service to them, then it's beautiful. Nick Hauser:	So, how important do you think it is for somebody who's helping others with a personal transformation to share a bit about their own situation, their own journey, or struggles, they've gone through and overcome, if they did, actually, go through that? Alex Kemp:	I definitely think it's important. I think it makes people feel really comfortable, and if you're, often times, that's how people safe, is if you're vulnerable with them, too. Or, you just give them that kind of space, and if it's like, "I've been through this, and that's why I want to help people, 'cause I got myself out of this situation, or something, or whatever you're version of that is," then I think it's really powerful to put your message out there in that way. Nick Hauser:	So when these people start resonating with you, and they see your vulnerability, and they respect that, and it allows them to gravitate towards you, right? Alex Kemp:	Yeah. Nick Hauser:	They message you and say, "Hey, I'm struggling with this." For you and your the way you operate your business, what happens next? Do you message them back, do you get them on a phone call? What does that look like? Alex Kemp:	Yeah, I just say, "Hey, let's get on a call. I'd love to hear more about what you're experiencing and talk solutions." And, most people, it's been as easy as that. Or, other people are, if they're not giving me enough, I'll really try to dig into the pain point a little more to hear, is this really someone that I can serve? And then, if it's a yes, then, I'll get them on a call. Nick Hauser:	And that call, is that a full strategy session, like 45 minutes? Alex Kemp:	Yeah. Nick Hauser:	And, how have you found with a personal transformation, structuring your script and such, and conducting this strategy session, based on of what we provide in the training. Alex Kemp:	Yeah, so for me the whole first part is so effortless. It's like what you do in a coaching session, anyways. You try to dig into the problem. And, I just really try to dig into the problem, and then I get the structure. Like, so how often are you dealing with this problem? How is it affecting these different areas of your life? And then, I use the script for the most part, and then once I get to the price point, or when I say my message, the response is always, wow that's perfect, or something like that. And then, when I picked the price, my only ... Yeah. That's kind of been the barrier, or the filter, I call it, of just who said yes and who says no. But, most people I've noticed with heavier pain points, always say yes. Nick Hauser:	And, what is the actually structure of, you're helping these people with emotional blockages, what is the structure of your offering and coaching? Alex Kemp:	So, I work with people for eight weeks, and in the beginning we do the healing work with this emotional blockage that's come up for them, and then we do a life restructuring and an integration the next few weeks, and then we coach based on what's coming up after that and help people really follow through and keep leveling up. Nick Hauser:	What do you mean by leveling up? Alex Kemp:	Like, leveling up different parts of their lives. So, sometimes, like I said, someone will have this thing taking up energy and then when they start to focus on other areas, they're like, You know what, I really want to be more authentic in my relationships, or I really want to focus on taking better care of my health, or things like that and I have those tools as well, that help me equip them on other parts of their journey. Nick Hauser:	And, okay, so how did you come up with this kind of structure, and eight weeks, and all that? Alex Kemp:	Trial and error. A lot of people, in the past when I was coaching, a lot of people advised me to have long term clients. But, I just didn't feel like that was necessary. So, when Same said six to twelve weeks for one on one coaching, eight weeks just resonated, and then I tried it out, and it was super successful the first few times. And then, I just, yeah, kept going. Just started working. Yeah. Nick Hauser:	And, what do you price the offer at? Alex Kemp:	It's at 2,000 right now for eight weeks. Nick Hauser:	Gotcha. And, you mentioned, too, like on the actual call, that's usually the threshold from determining like the person with more pain is the one who is more willing to say yes. Which, makes sense. How do you determine that when you're either speaking to somebody on the sales call or you're talking to them initially, when they might reach out to you? Alex Kemp:	So, on the call, I feel it when people ... Well, sometimes, emotions come up on the call and there people can be crying or having an emotional experience like that. And, sometimes, I can just feel how ready a person is, how long they've been struggling with something, and how long they haven't been able to forgive themselves, or haven't been able to get over something, and they're just done. Most people, I've noticed, come to me after months of stuffing with some things. It's just like they have not been able to figure it out on their own. So, I have a good direct roadmap for you. Then its like, boom. And then, as for the direct outreach, it is ... I can just navigate the pain point, because I feel like that's another one of my gifts, is being able to feel into people, and to be able to assess the way people are feeling. When someone walks in the room, I feel like I already know, or when someone even messages me, I can feel it through their words. So, that's kind of been harnessing that gift to, yeah, attract people. Nick Hauser:	Where do you think that gift comes from? Alex Kemp:	It just feel innate. Yeah, I think it's been nurtured a lot, definitely. But I also think it is something that is innate. Nick Hauser:	What do you mean by nurtured? Alex Kemp:	I think that I've cultivated that gift a lot, and I really realized it was a gift and tapped into it even more. Nick Hauser:	Got it. And so, these people reach out to you and then they start working with you and for eight weeks, and then do they continue to work with you after or how is that set up? Alex Kemp:	No. I just do a few check in messages, but no. And that's the cool part. I would only want someone to work with me again, or go through the process again if they were experiencing something again, which is totally likely 'cause we are human. But, other than that, I don't foresee having repeats clients. Nick Hauser:	This is an interesting one because it's laid out in the training, the way we recommend to conduct a strategy session together to when you're trying to see if somebody is a good fit to make them an offer to work together or not. You know, it's very don't reveal your hand to them, to be very patient and don't make the prospect feel like they're being judged in a positive or negative way. If somebody starts crying and getting really deep in these things, how do you navigate that without breaking the rapport, you know? Alex Kemp:	Yeah, totally. I just say, "Um, I hear you." I just make someone feel heard. I think that's the most important thing. It was hard in the beginning not to coach, not coach someone through something, but just to let them feel it and to know that we're about to talk solutions. So, we can feel it for this moment from a neutral place. You know? Nick Hauser:	Yeah, that makes sense. So you've started landing the clients, have you found that Instagram and the organic thing to be predictable for what you've been doing so far? Alex Kemp:	Yeah. I think what's interesting is, I feel like I'm already starting to experience the compound interest of things, and it's been such a short time. Because for me, the direct outreach was super draining in the beginning, trying to find people, and then trying to just do it, but it was like everyday, I have 30 messages and go, go, go. And then, now I feel like I've cut back to maybe 15 a day, or something, just because I'm going through a transition right now. But, still having people reach out to me more, and more, and more. I have a strategy session after this, and it's someone who reached out yesterday. So, it's just people are starting to come in and then I'm also starting to post more about client results, so that's how things are filtering in as well. Nick Hauser:	Sure. And you mentioned you were going through a transition. Did you mean in the business at the moment. Alex Kemp:	I meant in my life. Yeah. Personally. Nick Hauser:	Got it. Alex Kemp:	Yeah. Nick Hauser:	Is it something you wanna share here? Alex Kemp:	Sure. I'm moving to Brooklyn. So, I'm going to back home to California and live in Nomadic for years now, and my partner and I are ready to settle down. So, we are moving to Brooklyn in a week. So ... Nick Hauser:	So, you've been living that laptop lifestyle, and such. Alex Kemp:	Yeah. Nick Hauser:	Now, this is an interesting point too. We always talk about focus. Right? The power of focus. How have you figured out how to do that as a digital nomad traveling around, being at different places for certain aspects of time, not having that one set place, how have you found to make that work. Alex Kemp:	So, for me when I started out this program, I had to make it work. That was the big thing. I needed to make it work. I was so thirsty for change in my life I was willing to do literally anything, and this is the ... I didn't go to college so this is the most I ever invested in myself, and personally, and at one time, and so it was really a big leap for me. But, I just knew. I knew I had to do it, and so it was really powerful to be like, okay, I'm going to do this. I was also living at my parents house at the time. So, I was like I am going to do my 30 day attack, and I also knew that by a certain date that I had made an agreement to leave my parents house, so I was like, okay I have till this time. Then, I gave myself a two day break when I came here, and then I started working on it again. Started doing my attack plan, and I've been here for a month now, so that's how this stretch of my attack, that's how it's been. And, yeah, so it was really hard in the transitions. It was really hard in the beginning, I won't even lie. It was ... I saw so many of my patterns of existence in such a short window of time. I was kind of crazy to see like when I would want to stop and one of the things that always plays in my head is, if you wanna stop, what is it pulling you away from and what is it drawing you towards. And so, I think I always, really had to think about that when I was traveling. And then, once I landed here, we were in one place for three weeks, and then we kind of scheduled it all out because we knew we were going back for Thanksgiving and stuff. So, I just knew that I was going to have these certain blocks of time so I was able to have a schedule, which I also have never done when traveling before. But, it was super helpful. Nick Hauser:	So, having that plan and structure in place, even though your location may be changing, still almost acting as if you were in one place with a set routine. Alex Kemp:	Exactly. Nick Hauser:	Now, when you were traveling before you set that up, what were you getting pulled towards that was taking you away from working on your business. Alex Kemp:	So, when I was traveling before, I was actually working as a customer service rep for my partner's brother's clothing company. And, I was doing that online while I was working, so I was able to travel and work, which was awesome. So, that gave me a taste of this freedom, of this lifestyle where I get to make my own schedule and be a digital nomad. And, then we ended up both quitting at the same time earlier this year, 'cause I was like I have to start my coaching business. So, then I started, back in April, I think. And so, before I wasn't really focusing on my business, and I also had this emptiness because I knew what I wanted to be doing, but I just didn't have the courage to take the leap yet, or didn't believe in my skills, all that stuff. And so, this whole journey has been a process of believing in myself and having the confidence, and then, by the time I found this program, I feel like I was truly in a place where I was ready to commit and ready to share my gifts with the world. Nick Hauser:	What would you say is the biggest thing that, working through the program, what's been the biggest thing that really helped things click for you for that confidence and moving forward, that self belief to really just spread your message across here and do what you really wanna do. Alex Kemp:	I think I was just knowing that in order to make money, you have to provide some sort of value to the world. And, I have always had this feeling that I have so much to give to the world and I had a feeling before that I had so much to give to the world, but I was never receiving. So, I wasn't receiving in the same way, and so this program really helped me back up the money side. And I think how it really helped me is that is really grounded things down into a very practical and forward manner that was so refreshing for me because there's honestly so much crap and confusion out there, and I've looked ... I was actually also enrolled in a program, it was like a women's entrepreneur coaching mastermind the day before I found the webinar. And, I watched the webinar, and I got refunded from that program, and I made the leap to do this program because I just knew this is a direct and straightforward way to do what I need to do and that was not giving me the clarity already. And so, I think that just the clarity was so perfect. Nick Hauser:	Got it. And so, you're at the point now where you've gone from 600 to 10K a month with your coaching program. What do your next steps look like? What are you planning for and such? Alex Kemp:	I know that I'm ready to raise my prices, and that one is an area where I definitely have self doubt come up again. But, I want to be ... My goal is to be making six figures by my 23rd birthday which is in June, so that's my next goal, so I really want to keep leveling up my income each month. Nick Hauser:	What do feel like stopping you from really raising the prices? Alex Kemp:	Because it's an emotional thing, and I know it's tangible because I've seen it in tangibly for my clients. It's was such a stretch to go from $600 from eight weeks to $2,000 for eight weeks, that saying even $3,000. But, I know I can do it. It's just a matter of taking the leap to just keep pushing and doing it. So, I just think there's an internal ... It's a worthiness thing. Is it really worth it, or is someone really gonna invest that much in their well-being and in freeing themselves from whatever they're feeling stuck by? Nick Hauser:	Some of these major problems that people are coming to you with, though, you're really helping them transform and break through in their life. What do you feel like that's worth? Alex Kemp:	It's hard to put a number on it, honestly. Yeah. And what I'm noticing is, the higher ... So, in the beginning it was just $1500 'cause that was already a stretch for me, and then it was to $2,000, and then when I got to the $2,000 price point, the people who were coming to me were dealing with even more intense things. I could tell that the intensity ramped up. Which, I like intensity because I feel like I can navigate it pretty well, and with a clear head, and can pull ... Like, what we're doing, right, is like in our own way pulling people back to the truth. And so, it's such a beautiful process, and so I think if I am working with people with high pain points and I do see the worthiness of it as well. Nick Hauser:	Got it. So, when do you think you're gonna increase the prices next? Alex Kemp:	My next sale ... My next ... Today. Nick Hauser:	Yeah. It sounds like it. You know. If you're really getting them great results ... I know a lot of people deal with that issue, especially when they're helping somebody with a personal transformation. Because it may be easier to understand in your own head, for like a business that, well if I charge them this, and they get three times, ten times, 100 times, DRY it's totally worth it, and totally makes sense. It's hard to measure that sometimes with that. How do you think about that, when you're thinking about charging different prices, and are you looking for anything specifically in the results your client's getting to justify that, hey I have the confidence that this working, now I can, maybe, take things to the next level. Alex Kemp:	That's a good question. I think that if I was looking at results that I would have more confidence. But, it's easy to have the perspective of what ... Yeah. I don't know. It is just harder to justify, like you said, with business or with something where you're working with dollars it's easier to know how to price something, or know what it's value is. But, I also another big part of it is breaking beyond the limiting monetary beliefs, which is something I'm that I'm working on for myself, and I also happen to be helping clients with that as well. Because the number one belief that I had that was blocking me from making money is I am unworthy. That's what I used to believe. I can't make that much money. I'm not worthy of making that much money. And then once I just switched to I am worthy, everything changed. And so, it's the same exact thing now, it's just going even deeper with it. Nick Hauser:	How did you actually make that switch to saying I'm not worth it, to I'm totally worth it? Alex Kemp:	I think it was getting the affirmations from the strategy sessions. And, it was doing the affirmations as well. There's only been two days where I haven't listened to them since I made it. So, it's been like, yeah, I don't even know how long I've been listening to those, but it's when I wake up, and when I fall asleep, and so that plays such a huge role in such a subtle way. And so, that is something that really helps me. And then also, just yeah, as I'm getting the results from my clients, and as I'm having these experiences that really lighten me up too. I'm like, this is so worth it. I feel high when I get off of sales calls. Not even sales calls, all calls. I feel so blessed to be doing the work that I'm doing, and it makes me feel so alive, so that's also helped me feel worthy because I understand the value that I'm adding to people's lives. Nick Hauser:	And now, you know like big picture, it's only been like 90 days and you're at 10K, what is the bigger picture here over the next five years, like the five year vision for you and your business, and what you're really trying to do here. Alex Kemp:	Oh, that's a good one. So, my five year vision is really to help people heal, and to help people find well-being within themselves, and free themselves, and have the tools that they can use to do so. So, like after people work with me, they have these tools forever, so they can help themselves move through their other emotional blockages when life comes. But, I just know that the human experience is not always clear or easy. And, there are some things that are very real and very heavy, and my intention is to help heal people and to help people just live the lives that they actually wanna live, and not feel stuck and feel free. So, I wanna help as many people do that as I can. So, I foresee a course. I could foresee doing a lot of group stuff and facilitation in that way, which excites me and scares me. So, yeah, I'm excited. Nick Hauser:	Why is that important for you to really help a large amount of people, and give them those tools. Alex Kemp:	Well, I genuinely believe that self reflection and self awareness can change the worlds because if we understood that everything is a mirror, right, and everything is pointing us back to ourselves, and that we can keep evolving, keep growing, keep transforming. If we were equipped with those tools when we were younger, the world would be such a different place. And so, I really want to equip people with those tools because I feel like it would change everything, the way that we relate to one another, the way that we relate to our planet, the way that we relate to ourselves, and so, it's all about just like trying to better ourselves and being the best versions that we can possibly be. That's why it's important. Nick Hauser:	Got it. And you've been through the program now 90 days, what has been the most transformative part of the program for you in your life. Alex Kemp:	I definitely would say for my life, my day to day, it definitely was week two, which was the mindset training. And, that was just so powerful to really go through everything, and another thing is I put Brooklyn, I put New York on my vision, or my dream ... What is it called? Nick Hauser:	Alchemy of self. Alex Kemp:	Yeah. Alchemy of self. Yeah. And, I didn't even think that was going to happen anytime soon. I didn't ... I was like, okay, I'm gonna put it on there. And then it's like what, a month and a half later or something, and it's already ... Yes, now is the time. So, it's pretty crazy just to see all of the how you are the creator of your own reality. You get to choose what kind of life you wanna live. You get to choose who you want to be. You get to choose your story. And so, that has always been something that really rings true for me, and I realize that there were some areas that I was being blind to and that I wasn't taking full responsibility. So, now I feel like I'm in a place where I am taking that responsibility. Yeah. Nick Hauser:	And, you know, who is Alex Kemp becoming now, moving forward? Alex Kemp:	She's becoming the most loving version of herself, the best version of herself that she can be. She's becoming a powerful entrepreneur, someone who helps so many people to transcend themselves ultimately, and she's becoming an amazing partner, family member, friend, yeah. She's forever ... My Instagram is Alexandria Unfolding, because it's just forever unfolding, forever becoming. Nick Hauser:	Got it. And what would your advice be to other members of the program who are just starting out or they're feeling stuck in the moment, what would your number one piece of advice be from what you've learned that you would give to them? Alex Kemp:	This quote just came to mind. It's "Feel the fear and do it anyways." Just keep pushing. Do the work. Hear the limiting beliefs and just push past them, and it will get you somewhere that's better than the place where you would be if you were to listen to those voices. You know. So, it's like would you rather listen to those voices, or would you rather try something different and for me trying something different has been totally worth it. Nick Hauser:	Awesome. To wrap up here too, where can people find more information about you online. Alex Kemp:	So, I have my Instagram which is Alexandria.unfolding, and then I have my website, which is AlexUnfolding.com. Nick Hauser:	Awesome. It's been great speaking with you and really digging in and hearing your story again. It's awesome to see somebody who is helping people with personal transformations. It's always good to get that perspective to because we always have that dynamic going on in the group and members of the program. So, really appreciate you hopping on and look forward to seeing you feature results and moving forward to how you're gonna grow this thing out. Alex Kemp:	Cool. Thanks so much Nick. You're awesome. Nick Hauser:	Awesome. See ya. Alex Kemp:	Alright, bye.